Devising ways of working sustainably is at the heart of what we do and spans financial, social and environmental considerations. Sustainability is a key area that is naturally integrated into our activities. Working on a building site is one of the world’s most hazardous occupations. 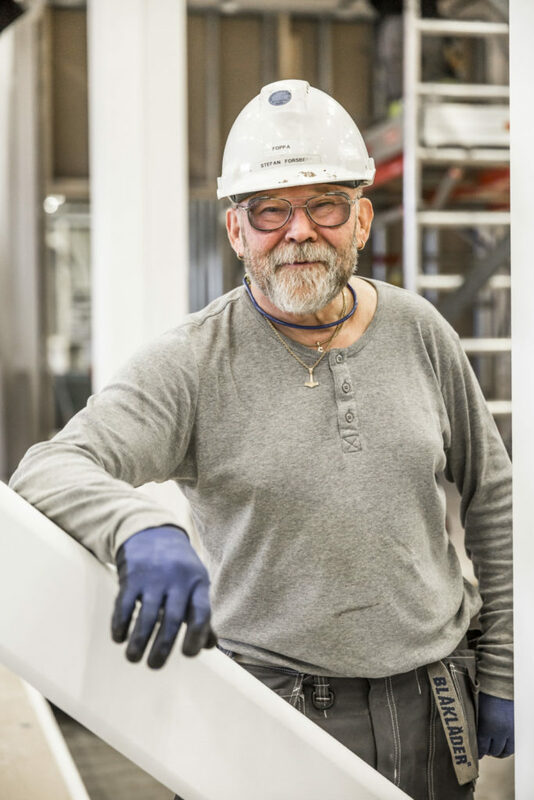 This is why maintaining a safe, sound work environment has been identified as a key strategic area for Swedish Modules. We are proud to have substantially reduced risks in this respect through effective, systematic work environment management. Our main priority is to ensure everyone returns home safe and sound at the end of the day, and we constantly devote considerable resources to fostering a culture of safety. The objective is to maintain a workplace that is both progressive and physically, psychologically and socially sound for every employee, in which the risks of occupational injury and work-related ill-health are prevented. For example, one tangible factor that reduces risk is that our employees based in the factory only work at a height of around 0.5 metres. We are also fully committed to maintaining a democratic workplace in which every employee is equal, whatever their role. We constantly evaluate the company’s work environment measures in order to make regular improvements to our day-to-day work environment management. Our quality standards are a result of the company’s long presence in high-specification industries, permeating our culture and everything we do. Through a high degree of technical content and an extensive level of prefabrication, we can provide quality assurance and reliable delivery, thereby minimising the risk of delays and increased costs. One factor that ensures high quality is that the modules are built indoors, with the product protected throughout the production period. All equipment is installed prior to delivery, which saves considerable time and costs on site and ensures delivery and commissioning for end consumers. Our tried and tested production methods enable us to maintain price, quality and date of delivery. Our objective is to undertake at least 95 percent of the work in our own factory. Maintaining effective processes on site means working more safely. In tandem with several years’ experience, our quality system enables us to deliver to a high standard, safeguarding the value we create for our customers’ businesses. Our work is also undertaken in accordance with Good Manufacturing Practice (cGMP) and FDA requirements, where required. Our prioritised areas are regulated by clear policies that are effectively implemented in our day-to-day activities. These cover areas including the environment, quality, work environment and a number of key policies that contribute to a safe and inviting work environment, including a gender equality and equal treatment plan, staff policy and stress policy. Naturally, our code of conduct is integral, particularly as our operations span right across the globe. We believe in collaboration underpinned by transparency and openness in business processes at every level, all the way from start to finish. 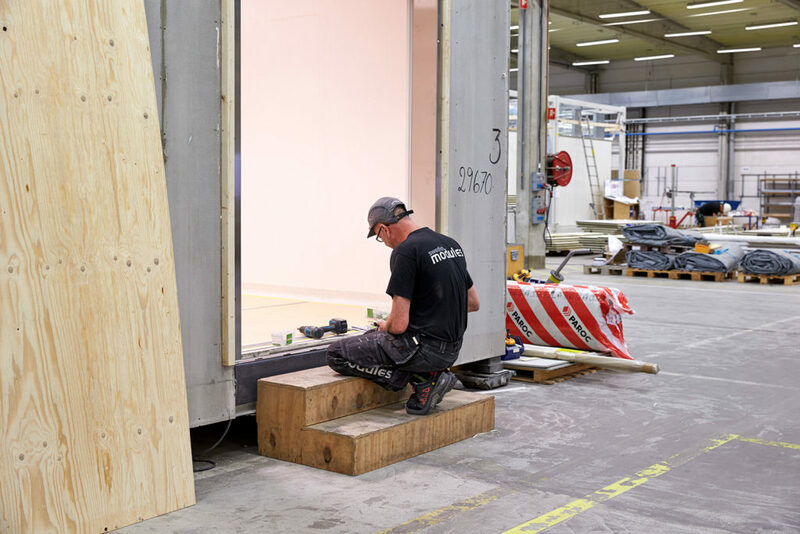 At Swedish Modules, we are strongly committed to environmental issues and work day-to-day towards minimising our environmental impact and developing new, sustainable working methods. By carrying out modular construction on site in our factory, we keep close track of material consumption and minimise waste. In addition, purchasing and dispatch are planned in order to optimise all transport, which is scheduled during short periods. We also work to the ISO 14001 standard, which relates to environmental management.